There are 66 potential obstacles to the successful sale of a business. One moment while we verify your account. 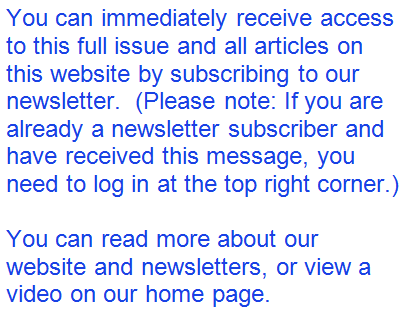 If you become a newsletter subscriber you have free access to the entire website. In the last issue (#22), we examined Customers, Suppliers and Competitors as Buyer Prospects. This issue identifies 66 Obstacles to a Successful Business Sale. There are at least 66 reasons only 20-25% of small businesses are ever sold. To successfully sell your business, you should be aware of the following 66 obstacles that might be encountered and should be overcome or disclosed. At the rate of 11 obstacles per newsletter issue, in the next six issues we'll provide a brief synopsis of each obstacle. with all kinds of obstacles and problems along the way. Overcome the Power of Inertia and call a business broker for a free consultation. Many brokers offer no-charge, no-obligation evaluations of small businesses. They can provide a broker opinion of value and help you identify obstacles to a successful sale as well as opportunities for improvement to increase the value of your business. That is a great way to start planning for a successful and profitable exit from your business. "How to Sell a Business"
Disclaimer: The information contained in our Newsletters and on our Website are provided for informational purposes only, and should not be construed as legal advice on any subject matter. You should not act or refrain from acting on the basis of any content included in our Newsletters or on our Website without seeking appropriate advice on your particular facts and circumstances from professional advisors in your state. The author, Biz Owner Communications, LLC and its owners expressly disclaim all liability in respect to actions taken or not taken based on any or all the contents of this Website, our Newsletters or other email communications.